Great Ocean Road and Phillip Island in one day - Really? Among the most popular tours around Melbourne, two are particularly notable – a drive along the Great Ocean Road and a visit to Phillip Island Here we discuss the best way to complete these trips. So, suppose this is your first time in Melbourne. No, let’s say this is your first time in Australia. Wow! Here she is, the distant land of your dreams, inhabited by fascinating animals and landscapes. Let’s decide where we will head to first. Unfortunately, we don’t have much time, but we want to see as much as possible! Around Melbourne and the state of Victoria are many, I would say very, very interesting places many of which you should visit. Sydney – no offence, but the surroundings of the oldest city in Australia are not so attractive to tourists. At least, there are more sites to visit in Victoria. Of course, your time here is limited so we will have to choose the best of the best. Route number one, the undisputed leader among the guests of Victoria is a journey along the Great Ocean Road. The road starts about 100 km Southwest of Melbourne near the small town of Torquay. Nearly 65% of the road passes along the ocean’s coast with absolutely astounding views, which are the primary interest for this route. The route’s total length is about 240 km, from Torquay to Warrnambool. The second route by popularity is a trip to the Penguin Parade on Phillip Island. By the way, not Philipp, but specifically Phillip island, as the island was named in honour of the first governor of the New South Wales colony, Arthur Phillip. It is a surname, not a first name. The island is located 140 km Southeast of Melbourne, the drive to it takes approximately two hours. The island is small, about 125 square km, connected to the mainland via a bridge which is easily accessible. The island is chock full of curious tourist attractions, which you can easily spend a whole day visiting. Among them are Panny’s Chocolate Factory, ‘A Maze N Things’ museum of illusions, the Koala Conservation Center, the Churchill Island Heritage Farm and much, much more. But of course, the most popular destination on the island, one of Australia’s biggest attractions is the Penguin Parade. Penguins have inhabited this island for thousands and thousands of years. The first commercial viewing of this spectacle, which was very fittingly called the Parade, took place in distant 1922, so it will soon turn 100 years old. It is important to note, that the penguins appear on the beach only after sunset. On one hand, this is convenient, as you can know exactly when you need to be at the stands to observe this event, but on the other hand, there is no power in the world that can convince the penguins to emerge before the sun goes down. So, don’t be especially hasty, if you wish to see the parade at any other time of day, you should relax and accept the fact, the penguins won’t come out before sunset. Full stop, end of story. So if you want to see only the parade, without visiting other places on the island, you need to arrive about an hour before sunset. How long you choose to observe these small, flightless birds as they waddle to their burrows is up to you, but usually not longer than an hour, a maximum of one and a half. Then we will return to Melbourne, which will take about two hours. Well, unfortunately, I have to disappoint you, dear reader, that in reality making this trip in one day is practically impossible. The first and most notable reason – the distance. The 12 Apostles, which without a doubt are the primary destination along the Great Ocean Road are about 250 km from Melbourne, and the Penguin Parade is 140 km from Melbourne, in opposite directions. 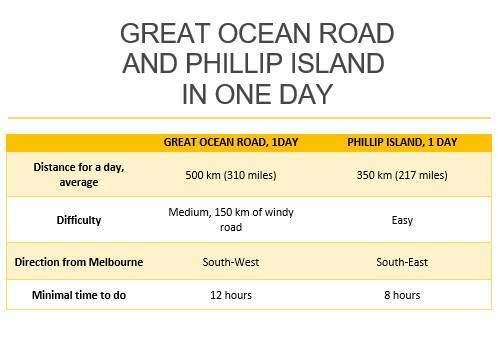 In other words, to reach both destinations in the same day you would need to drive at least 650 km to Phillip Island, then after the Penguin Parade return to Melbourne, adding another 140 km – that is 850 km in one day. This is possible, but only if you just drive and drive without stopping for observation points, snacks, lunch and toilet breaks. We are after all talking about real people, which are often on holiday and breaking the record for maximum distance travelled across Australia in one day typically isn’t part of their plan. 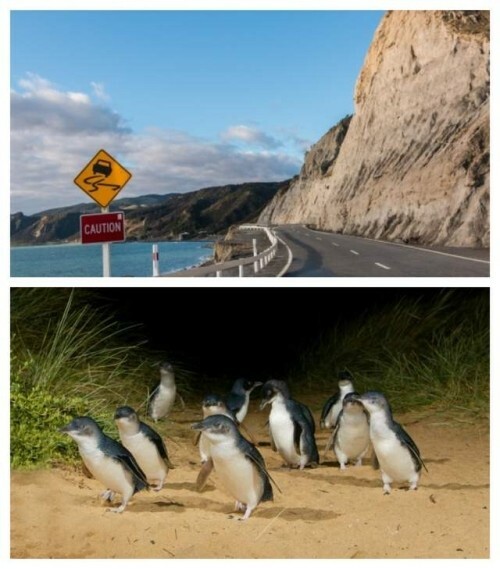 So, our answer to the question “Can I see the Great Ocean Road and the Penguin Parade in one day?” – is No, you can’t. So first you make a trip along the Great Ocean Road, and then, the following day you will go to the Penguin Parade. One more piece of advice, in that particular order, first the Road, then the Parade, and not the other way around. If you head to the Island first, then you will arrive in Melbourne late in the evening, during the summer this is basically midnight, and then the next day you will need to get up at about 7 in the morning to head out at 9 for the 12 Apostles. It is easier to return from the Great Ocean Road at 9 in the evening, have a rest and the next day go to see the Penguins. BTW, We will be glad to offer you our custom tailored Great Ocean Road Private tour as well as the Phillip Island Private tour in two days, not one, sorry :). That’s all. Enjoy the wonderful sights along the Great Ocean Road and the cute penguins on Phillip Island!